Now there is no more excuse for not knowing the speed limit. 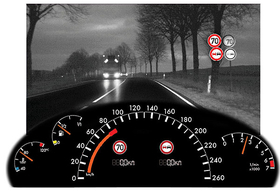 Suppliers such as Hella and Continental have systems that alert drivers on how fast they are allowed to drive in a particular area. The system is on the new BMW 7 series and Opel Insignia. 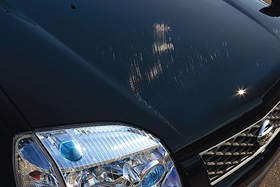 Nissan offers a clear paint that has a high elastic resin. Because the resin retains fluidity, the coating flows back into shape, erasing minor scratches. No need to adjust your rearview or your sideview mirrors to reduce glare. Mirrors from companies such as Gentex and Magna Donnelly take care of the problem for you. 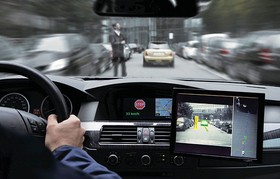 BMW is one of the companies using sensor technologies to recognize legs in motion and the direction of movement and the system reacts if the driver does not. It is still being tested at the moment. 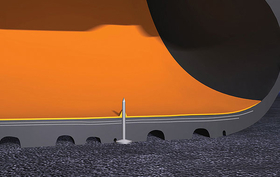 Continentals ContiSeal tires have a sticky, viscous layer that allows them to seal small punctures in the tread area. Get your foot off me! Continental has produced an accelerator pedal that communicates with the driver. The Accelerator Force Feedback Pedal gives warning of danger ahead by vibrating and exerting counter pressure in the accelerator pedal to get the driver to take his foot off the pedal and get ready to brake. 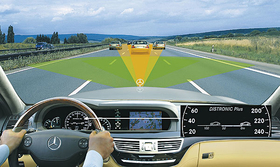 Mercedes-Benzs Distronic Plus adaptive cruise control, which is supplied by Bosch, can be tuned to stop the car. The system is available on the S class.